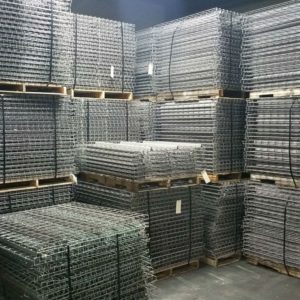 We have Thousands of Used Wire Decks At Any One Time! 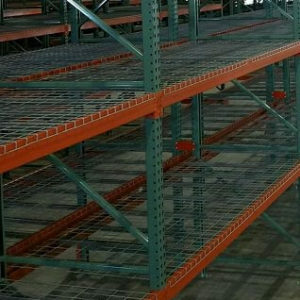 Wire Mesh decking is typically used to create shelf levels within the pallet rack system as well as providing added safety when stocking and picking your palletized products. If you have an application which requires you to store and pick products off the pallet rack shelf location then wire decks are the right choice. If you are operating out of a tall pallet rack system and need the added comfort of knowing that if your forklift operator doesn’t quite get the pallet at your top beam level pushed in all the way before lowering their forks and backing out of the pallet bay, then the wire decks are a must. 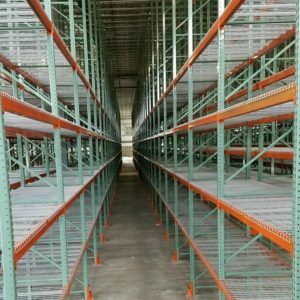 There are many different depths and widths of a pallet rack system and because of this wire mesh decks come in an array of sizes and capacities. They are constructed from heavy duty steel wire and steel channels. The channels of the wire decks sit in the steps of step beams and in some cases they will sit directly on the top of the beam . Wire decks prevent the accumulation of dust and debris within your pallet rack system. They also allow for water to be dispersed from your overhead sprinkler lines whereby allowing the water to travel throughout your rack system unlike other shelf systems that are made of plywood or particleboard. 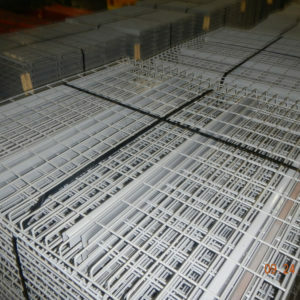 We Stock Thousands of New & Used Wire Mesh Decks In All Sizes. Ask About Our Quantity Discounts! Wire mesh decking is used as an alternative to traditional pallet rack shelves. 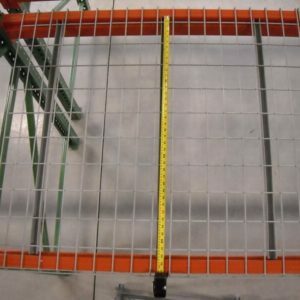 The use of wire mesh decking allows split case and open case inventory items to be stored in the pallet racking system. Wire mesh decking systems also distribute weight more evenly than pallet bars. 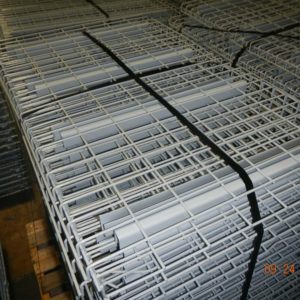 Wire mesh decking is also advantageous for use in warehouse settings because it can increase safety. The spaces in wire mesh decking allow light to flow through, creating better-lit warehouse spaces and less risk of injury for workers, who are then able to see more clearly. Wire mesh decking is also protective in the event of a fire because it allows water to pass through. Traditional wooden platforms only feed the fire and absorb water. 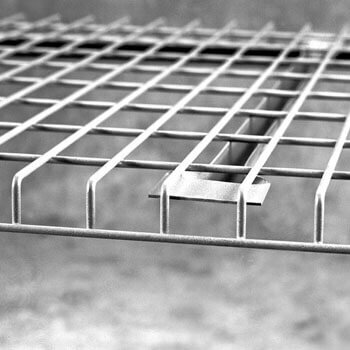 In some areas, wire mesh decking is mandated by local fire codes whenever there is a pallet racking system in use. Double Waterfall Wire Mesh decks are the most popular type of wire deck on market today. The name comes from the fact that at the at both ends of the double waterfall deck the wire mesh actually waterfalls over the top of the shelf beams. This provides additional capacity while ensuring the wire deck stays in position since it is locked in (Front to Rear) by the waterfall potion of the deck itself. The waterfall feather also eliminates any snagging of products while placing them on and off the wire deck shelf within the pallet rack system. For additional support the double waterfall wire mesh deck is supported by a series of U-channels which the wire portion of the deck rest on. In this application, the U-Channels actually sit in the step of the step beam. The step of the step beam usually measures 1 5/8” deep from the top of the beam to the top of the step portion of the beam that the wire deck channels rest on. Universal Wire Mesh Decking are designed to fit on both step beam, box beams and structural steel beams. In the case of a box or structural pallet rack beam there isn’t any lip or ledge for the traditional wire decks U-channel supports to rest on. The universal wire mesh deck solves this problem by using a similar U-Channel support that bends upward at the front and rear of the deck creating a flange type piece of steel that set on top of the box and structural beams. 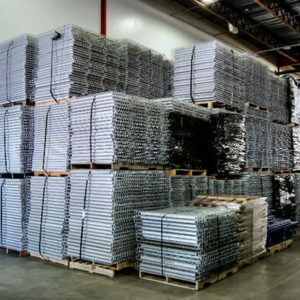 Save up to 50% off the USA’s largest stockpile of Used Pallet Racks and Cantilever Racking.